Milani was nice enough to provide 15 cases filled with goodies from their spring line for the Beauty Bloggers Orlando Event which I was lucky enough to receive! This will be the first of many Milani posts since they have provided so much stuff for me to review! 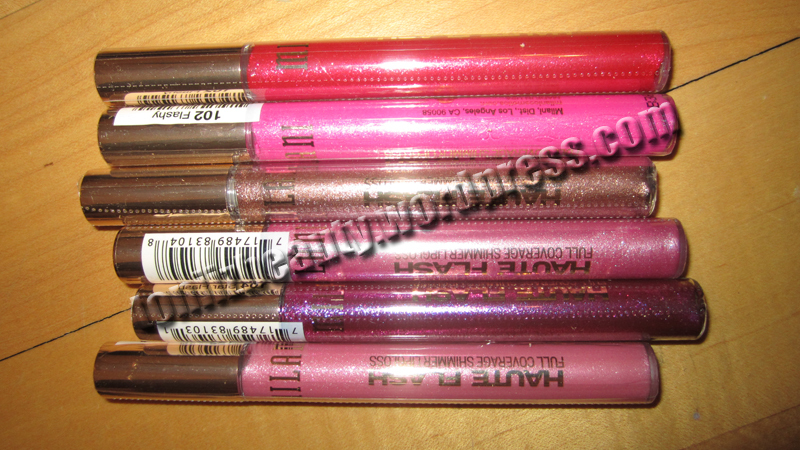 Anyway this post is about the Haute Flash Full Coverage Shimmer Lipgloss! First of all I just want to say I absolutely LOVE these lipglosses! The pigmentation is amazing and they are very buildable lip glosses. If you want more intense color keep on applying it. I was very impressed with the pigmentation I’m not going to lie. Another thing I love about this gloss is that its not sticky. I’ve found the most of the time when lip glosses are pigmented they tend to be very sticky. I’m also usually not a fan of glosses that have a lot of shimmer because sometimes those shimmers can end up looking crusty on your lips after awhile but so far this hasn’t happened to me with these glosses. These glosses also make my lips feel really soft and the applicator is a flat doe-foot which I feel made an easier application. My favorites of the bunch are “Hot Flash” which is this gorgeous fiery red color and “In A Flash” which is a beautiful purple color. I feel like its difficult to find purple lipgloss. My camera did not even do these colors justice. They are bright and beautiful colors! The only negative thing I have to say is that I want to see even more colors. There were 2 pink colors (Star Flash, Quick Flash) that were very simliar, I would have traded one of the pinks for a nice orange gloss! I mean after all orange is the “it” color for spring this year. But overall these are definitely worth a try. According to the website they retail at $7.49. Very pretty on you, but they look so sheer. On me they are screaming bright. Love them! No on me they are very bright too. My camera didnt pick up the brightness of the colors. I mentioned that in the post. But yes I love them too! Oops, sorry. I guess I only skimmed the text. I love that they aren’t sticky too. I’m glad that you mentioned that point because it’s the first thing I always wonder when deciding on buying a brand I’m not familiar with. I’m sure others are the same way. I’ve wasted so much money on lip glosses because I get them home and they are sticky. Right in the garbage they go. BTW, your lips are perfect! So jealous!